This book will provide hours and hours of fun. 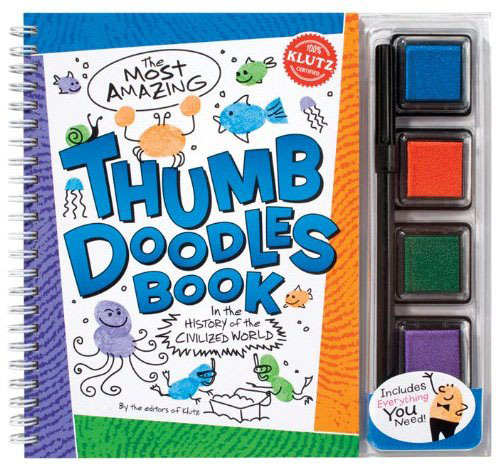 Thanks Klutz and Scholastic for coming up with such awesome products for kids. 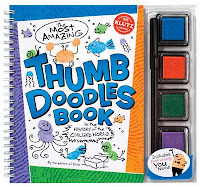 This book is full of activities you do right in the book and all of them can then be done again and again with your own paper. Thumbprint art, thumb print games and more. With Four colors of stamp pads and a pen, it comes with everything you need. The first thing the child does is a framed thumb print of the owner of the book. Get your hands dirty and play with this book - guaranteed fun for the whole family! My daughter asks to play with this every day!